With little preparation, Brenton Fischer skippered his grandfather Syd Fischer’s TP52 to second overall last year, but was penalised down to 38th after colliding with the Ark323 at the start. Ark323 retired, due to the damage. 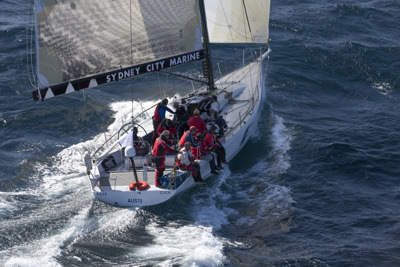 Brenton’s first Hobart was 2014 aboard Syd’s super maxi, Ragamuffin 100. Brenton skippered this yacht to line honours, IRC, ORCi and PHS wins in the 2014 Pittwater Coffs race, repeating Syd’s feat with the yacht the previous year - and scored good Hobart results with it: second overall in 2007, fourth in 2008, and third in 2011. He also took line and overall win in the 2008 Sydney Offshore Newcastle race, and won the 2007/2008 Blue Water Pointscore. Placed third in 2009-2010 and third in 2010/2011, when it won the Cape Byron Series (ORCi trophy for the BWPS). Adrienne Cahalan is navigator and will become the first woman to sail 25 Hobarts.